More progress! Slowly things are moving along. Still some negatives... but much better than the last 2 weeks. Isreal was here by 9am. 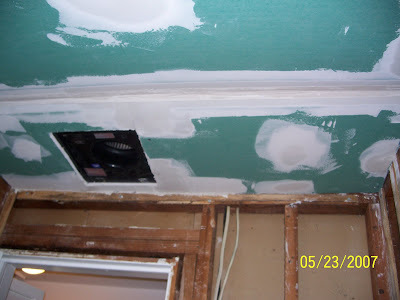 He got right to work on completing the insulation and the plywood flooring. It took a little while... but it's all done. 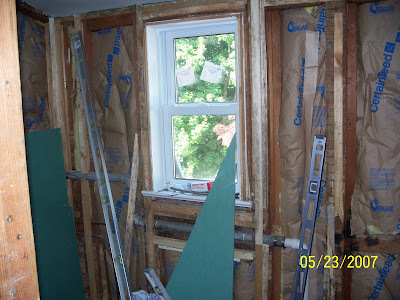 This is the completed wall insulation. After finishing the floor and insulation work he went right to work on the sheet rock. 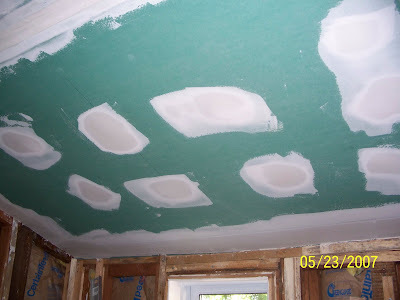 By the end of the day he finished the ceiling and put on the first coat of spackle. He also got the first piece of sheet rock on the wall that will be behind the vanity, medicine cabinet and toilet. You can see he also got the piece cut to shape and size for the top of that wall. 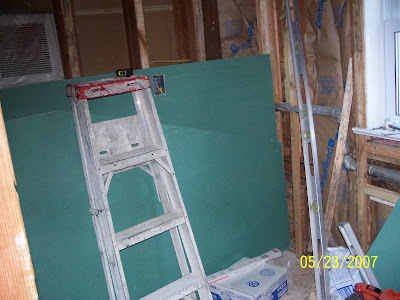 In the picture the piece with the straight top is all nailed in place, and the piece leaning up on that is the angled piece for the top of the wall. Negative 1... At around 3:30 Isreal informed me that earlier in the day he had talked to the plumbers to find out when they would be coming to finish up some work. They had completed what needed to be done for the "rough inspection" (we passed) but still had more to do. They didn't fully connect the heater and the pipes weren't installed to connect the tub drain, faucet fixture, or shower (among other things I'm sure). The plumbers told Isreal they would be over "after lunch"... and at 3:30 Isreal's only comment was "guess they take a really long lunch?" He was not very happy... his work is waiting on their work. gggrrrrr. Negative 2... It seems no one really discussed our "plans" with us. The reason that piece of wall sheet rock wasn't just put into place is because I pointed out to Isreal that the electric box for the light fixture wasn't moved to the right place. I just caught it before he cut the hole in the sheet rock for the electrical box. We did some measuring to figure out where the sink would be, so we could center the light. I also mentioned the fact that our medicine cabinet was suppose to be recessed, and asked if that has to be boxed out before putting the wall up. It does (of course). We talked about a couple other changes. Isreal mainly just said that with the "changes" his work for today was about done. He'd start the "new" work tomorrow. I know he'd figure it all out for us... but I called into the office and left a message about my concerns that no one really ever sat down to talk about the "design". And any conversations that were had... were with Nick (who isn't working with us anymore) and partial conversations with Phil (new supervisor) and Isreal (separately). So, I asked if we could just all get on the same page before continuing. I got a message back saying Phil would be over to talk to me tomorrow between 11 and 12. Hopefully this will relieve some of my new anxiety.